Chicks and ducklings are easily obtained at the nearest feed store, but where do you go to stock an aquaponics system? This is a (unrealistically) gorgeous aquaculuture system in which tilapia is being farmed. It's ok if yours doesn't look like this, you can still use these tips to stock it. The aquarium section at your local pet store is surely not the place to go. The large-scale hatcheries that supply fingerlings for recreational fishing in rivers and lakes may not be of much help either. Fortunately, there are more and more small hatcheries that specialize in the needs of backyard aquaculturists setting up shop throughout the country. Here’s our guide. In some ways, the process of obtaining baby fish to grow into edible-size fish is similar to sourcing chicks, ducklings, or turkey poults. The first step is figuring out which varieties are best suited to your region, the specific conditions in which you’ll raise them, and to your personal preferences. As with other baby livestock, fish fry are often available from mail order suppliers that will overnight them to your doorstep. That’s where the similarities end, however. For one, fish hatcheries with a good selection of fish suitable for homesteaders are tricky to find. There are also a lot of rules regulating both the shipping and cultivation of different species of fish, which vary from state to state and may limit your options – check with local authorities to learn more. There’s also a lot that can go wrong when transporting fish from one body of water to another – especially over vast distances. Fingerling size fish (1 to 4 inches) fair poorly in the mail and are expensive to ship, though you may be able to pick them up in person – just be prepared with an aerated tank of water to bring them home in (tiny 12-volt aerators are available that are designed to run off your car or truck battery). Ordering fry (less than 1 inch in size), which are shipped in bags with enough oxygen to last through their journey, is more cost effective. 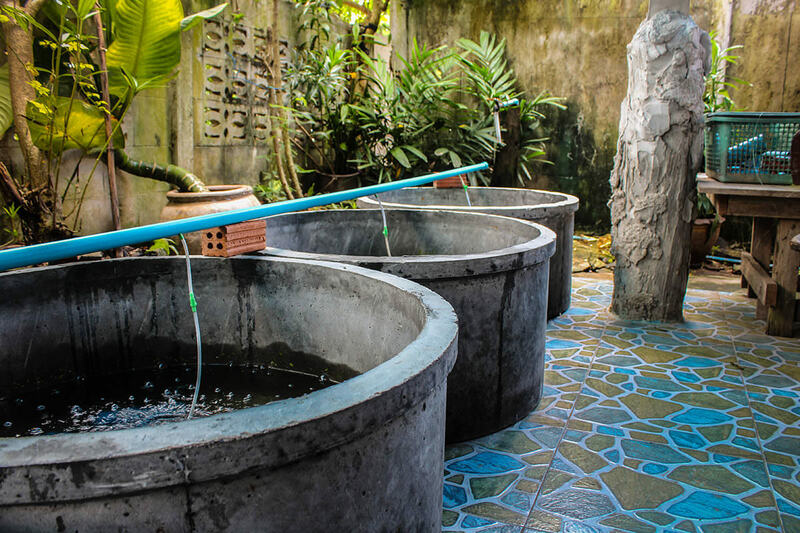 Here’s a selection of the best mail order hatcheries for backyard aquaculture. After deciding which kind of fish to get, you need to decide how many. The holy grail of commercial aquaculture is one pound of live fish per gallon of water. However, achieving this incredibly dense stocking rate is extremely difficult without state-of-the-art equipment to maintain water quality – and a lot of practical experience. The holy grail is one pound of live fish per gallon of water. A good ratio for your first season of raising fish is one pound per 10 gallons of water. Thus, if you have a 1000-gallon tank and you plan to harvest the fish once they reach one pound (a typical harvest size), order 100 fish. After you’ve gotten the hang of maintaining water quality for a season or two, work you way up to higher stocking rates. Your aquaculture system needs to be fully operational prior to their arrival, with a tank of dechlorinated water and a functioning aeration and filtration system. You’ll also need fingerling food, which you can grind into a powder to feed fry until they grow up a bit. Here’s a handy source for organic fish food. In order not to shock them, prepare a small transition tank where you gradually acclimate the fish to their new environment by adding a bit of the tank water to the water they came in every 20 minutes until they are swimming in a mixture that’s about half of each before you dump them into the main tank. Many aquaculturists add salt (4 to 5 teaspoons per gallon of water) to the transition tank, which helps remove any parasites the new fish might be carrying, and also helps rejuvenate fish that might be suffering from the journey. Ordinary, non-iodized table salt works perfectly. Also, be sure to remove any dead or noticeably diseased fish before releasing them into their new home. This hybrid, sometimes sold under the name Rocky Mountain White tilapia, is one of the most popular varieties for small scale aquaculture systems. They are fast-growing, disease-resistant, tolerant of poor water conditions, very tasty, and quite beautiful. There are various colors of tilapia to choose from (gray, gold, orange), though this refers to the scales, not the flesh. Other than that, the differences between them are relatively minor. Note that certain tilapia varieties are restricted in states where they are considered an invasive species. These bottom feeders are super tough and adapt to a wide range of water conditions. Some people object to the strong flavor, but like other aspects Southern cuisine, catfish is having a bit of a moment – the key is how you season it. There are a variety of perch suitable for small scale aquaculture, though yellow perch, a native of the Great Lakes, is the most common. They grow faster than most other perch, but still not as fast as tilapia. Unlike tilapia, perch thrive in cool water, and can overwinter outdoors in cold climates. Though not a popular dinner item in North America, carp are one of the most widely consumed fish throughout the world. They are extremely tough, fast-growing, and help to maintain good water quality in your tanks. Check local regulations as certain varieties of carp are considered invasive in many states – that doesn’t necessarily mean you can’t raise them, but you might need a special permit to verify that you’re keeping them in a way that prevents them from escaping into the wild. It’s possible to raise other types of bass in small scale aquaculture systems, but this is the only variety commonly used, as it has been bred for such conditions, and is much hardier, adaptable and fast-growing compared to the various wild bass species. It also has a milder flavor than wild bass, and has become quite common in North American grocery stores. Trout grow slowly and are a bit temperamental to raise, but their excellent flavor may be worth the time investment needed to learn how to raise them successfully. They’re tricky: Not only do they require cool temperatures, which can be hard to provide in summer in a small-scale tank system, but water quality needs to be top notch, too. Salmon have similar requirements as trout, but are even more sensitive to poor water quality. An added complexity is that they are typically raised from eggs, rather than fry or fingerlings, which requires a bit more technical knowledge to pull off.